THIS WEEKEND: More Cat & Kitten Adoption Goodness! 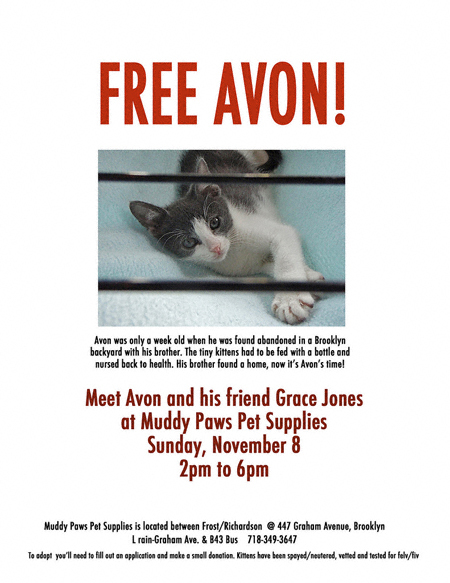 Earlier today I shared with you the good news about Empty Cages Collective’s adoption event tomorrow at PS9. Well, there will be even more adoptable cutie goodness on Sunday at Williamspoint’s very own Muddy Paws. As it would happen I know the folks who operate North Brooklyn Cats. Not only are they extremely dedicated, but they’re incredibly nice ladies to boot! Why not swing by and make the acquaintance of some of the finest felines to grace the Garden Spot of the Universe? Follows is a little footage of Avon (courtesy of Lisacat) to get you in the adoptable cutie spirit! November 8, 2009 starting at 2:00 p.m.